Chicken tandoori momos are as delicious like the tandoori chicken. How to make Momos : Mix maida, baking powder and water to make a smooth dough. Leave the dough overnight. Roll out medium sized chapattis from the dough. Now make a mixture of minced chicken, onion, ginger paste and salt to taste, to stuff in. 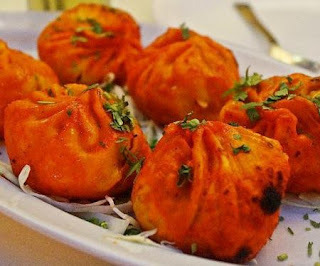 Again marinate these steamed momos with CHilli garlic sauce and put them in a hot tandoor till they are rightly cooked. To prepare chutney, churn the garlic, red chilli and vinegar in a mixer. Serve the momos with chutney.